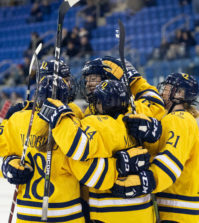 For the fourth consecutive season, the Quinnipiac women’s ice hockey team is heading to the playoffs. After several close calls in years past, including two consecutive semi-finals losses to arch-rival Cornell, this may finally be the year the Bobcats get over the hump. This year, the Bobcats are going into the playoffs with confidence. They have gone 7-2-1 in their last 10 games dating back to Jan. 18 vs. Robert Morris and have outscored their opponents 29-9. “We’re feeling pretty good since the last half has been pretty successful,” senior goaltender Victoria Vigilanti said. Senior captain Regan Boulton is determined as well. This confidence has them playing their best hockey of the season and has earned them the No. 4 seed in the ECAC Hockey Tournament. The Bobcats will face St. Lawrence in a best-of-three quarterfinals matchup this weekend. 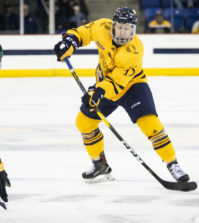 Quinnipiac (19-10-4, 13-6-3) went (1-0-1) against the Saints this season winning 6-4 on Nov. 17 and tying 1-1 last weekend in Canton, N.Y.
St. Lawrence (17-12-5, 12-6-4 ECAC) finished fifth with 28 points, but the Bobcats know they can beat them just like they did at home. “They have a great goalie, so we are going to make our shots count, get screens and take advantage of the back doors and rebounds and do a lot of pad passes because when she is on her game she is on her game,” Vigilanti said. Boulton believes another key to beating St. Lawrence is the Bobcats power play. Dartmouth routed the Saints, 7-2, on Feb. 23 and four of the Big Green’s goals were on the man-advantage. This is just the second time in program history that the Bobcats will have home ice for a postseason series. Cornell finished as the top seed in the ECAC followed by Clarkson and then Harvard. Quinnipiac has historically had trouble with Cornell but played them close this season losing 4-3 at Cornell in November but upsetting the then No. 4 ranked Big Red 4-1 in Hamden on Feb. 8th. “If we have to go to Cornell, we’ve had some tough losses there but I think that will make us much more motivated to come out and show them we’re not going to make it a third time and go all the way and hopefully take home that cup,” Vigilanti said. 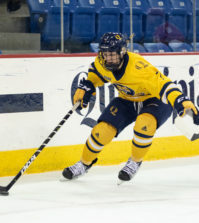 Against Clarkson the Bobcats lost 4-1 at home in the early part of season, and almost tied Clarkson if it wasn’t for a goal with 5 seconds left last weekend. It is Harvard which seems to be the toughest opponent for the Bobcats this postseason, as the Crimson swept the season series with a 2-0 win in Hamden on Oct. 26 and 4-0 in Cambridge in early January. Depth has been a strength of the Bobcats this season. Seven Bobcats have recorded more than 10 points and while Kelly Babsotck and Nicole Kosta garner most of the attention with 55 and 39 points, respectively, it is a group of players-Brittany Lyons, Kosta, Nicole Connery and Erica Uden Johansson that each have more than 10 goals. One player that has to step up this postseason according to Boulton and Vigilanti is Kosta. Nevertheless, Boulton and the Bobcats believe each team is vulnerable and that they can make it happen. “I think we can go all the way, 100 percent, the team is so confident right now and I have all the confidence in the world that we can do it,” Boulton said.